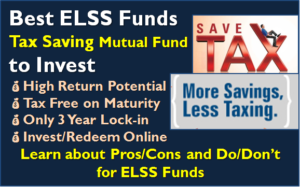 ELSS (Equity Linked Saving Scheme) or Tax Saving Mutual Funds are one of the best investment options for tax saving u/s 80C. These ELSS funds invest mainly in equities making them one of the best investments for long term wealth creation. High Returns: Of all the tax saving investments ELSS has the potential to give highest returns. Tax Free on Maturity: The gains made on redemption are long term capital gains (on equity) and so tax free. Lock-in Period: The ELSS funds have lock-in period of 3 years which means once invested you cannot redeem them before completion of 3 years. This is the shortest lock-in compared to all other tax saving investments. Buy/Redeem Online: You can buy most of Tax saving mutual funds online directly from company website. Also the redemption can be done online and the amount is directly credited to your bank account. This gives lot of convenience. Returns are Unpredictable: ELSS invests in equities and so the returns from these funds are linked to stock market performance. There are times when your money gets more than double in 3 years and also on the other side there can be significant loss. So it’s a high risk investment. However if you choose the right ELSS funds you can expect 10% to 12% returns in long term of 7 to 10 years. Once you are convinced about investment in ELSS funds, the next question is which fund to choose? Believe me it’s not easy thing to do. On the last count there were 41 open ended ELSS funds. To add to it there are several closed ended funds launched in January to March for last minute tax savers. Also most publications come out with their “Best Tax Saving Mutual Funds” list every year – which unfortunately keeps on changing. As the ELSS returns are linked to stock market no one can predict the returns for next 3 years. So it’s all guessing game based on historical data. We too give you five ELSS funds based on their historical risk/returns balance, consistency of returns, etc. The table below shows the 1, 3 , 5 and 10 year performance of selected ELSS Funds. Historically they have given decent returns. 1. If possible Invest “DIRECT” in ELSS funds. (Learn: How to invest “Direct” in Mutual Fund) If you use broker or invest through intermediaries, your return would come down by 0.5% to 1% every year due to commission paid to them. The table below shows the difference in returns in 3 years. 4. Select ONE or TWO ELSS funds for investment. Do NOT over diversify in multiple ELSS funds. 5. Invest in ELSS in sync with your other investments and overall investment plan. Also Read: Child Plans from Mutual Funds – Should you Invest? 7. It’s NOT necessary to redeem these ELSS funds after 3 years. It can remain invested as long as you want. 9. Choose growth option for long term wealth creation. 10. Dividend reinvestment option is not available for ELSS Funds. On death of unit-holder, the ELSS funds can be redeemed by the nominees/legal-heir only after completion of one year of investment. ELSS funds have to invest minimum 80% in equities or convertible bonds. The open ended ELSS funds have to open for subscription for at least 3 months every financial year. As New financial year has begun, need tips to invest in ELSS . Can you please let know for 2018 ? Sir, please suggest me two mutual fund for long term investment. I could not decide which are the best because there are many mutual fund scheme.